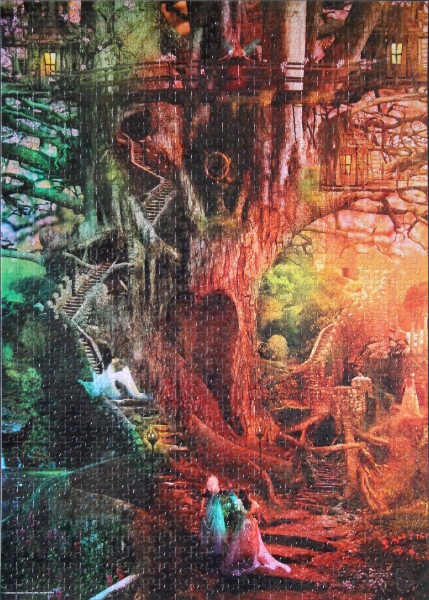 Puzzle: With its wonderful fantasy imagery and subtle colour variation, this is one of my favourite puzzles, so much so that it decorates the wall above my work desk. Reminiscent of Elven trees from Middle Earth’s Lothlórien, Vallenwood trees from Dragonlance, and Ygdrassil tree ships from the Hyperion Cantos, its winding steps, dwellings, and terraces are a calming, inspiring sight. The puzzle is not trivial, due to gradual colour changes and a variety of small elements. A good place to start is the yellow-orange region in the medium right, the dresses of figures ascending the staircase, the lit windows and the staircase, which can then serve as a near-vertical guide, splitting the picture into two regions. After that, darker green left side can be tackled, followed by red areas of tree bark, black bottom areas, and regions at the top of the tree. 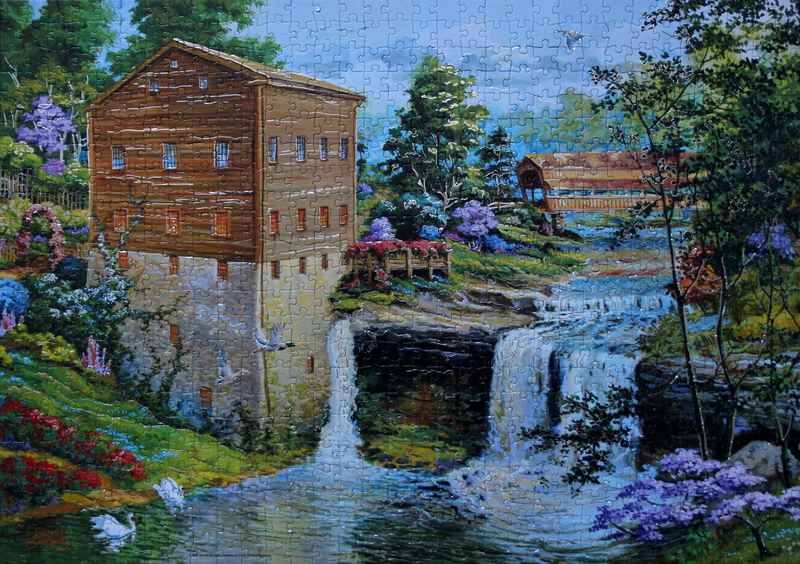 Good lighting is a bonus with this puzzle, but the beauty and detail in each region is worth extra effort. 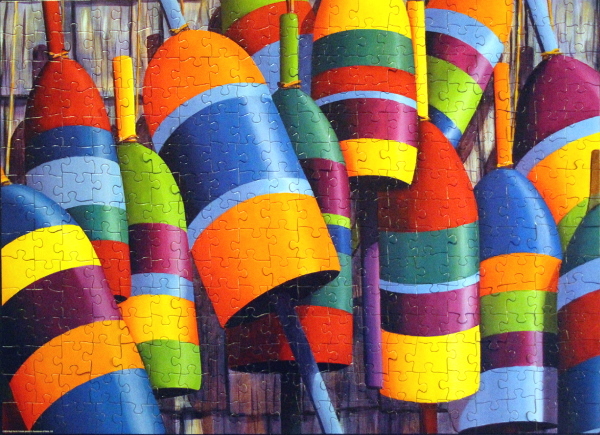 Puzzle: Jolly and colourful, this simple puzzle with large pieces was a hit with my son. He loved the bright colours and clear borders. Simple, vibrant, and refreshing. Puzzle: “Showpiece Lantern: A jigsaw worthy of display. – Snug interlocking allows the puzzle to be displayed without glue. – Puzzle stands on its own. – Pieces are easy to move, and do not fall apart when picked up. 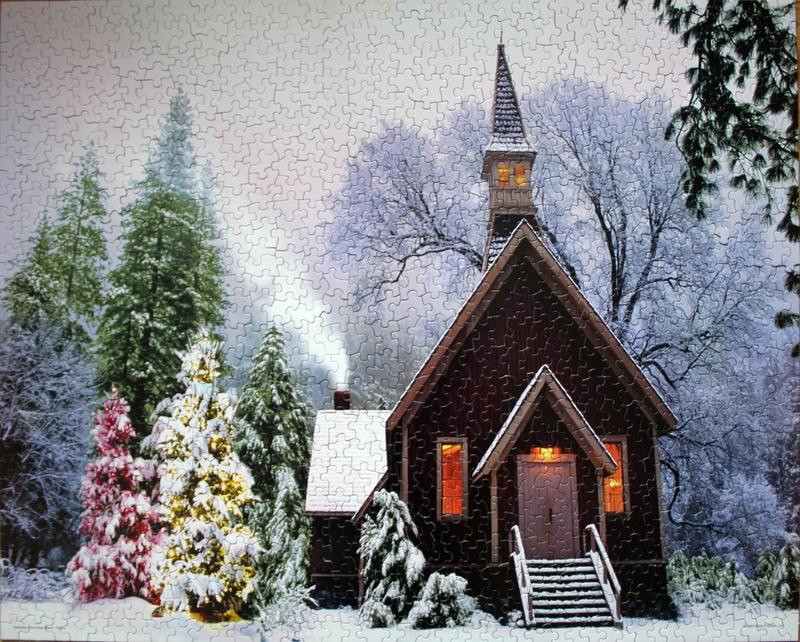 – Puzzle is made of durable, water proof plastic material. 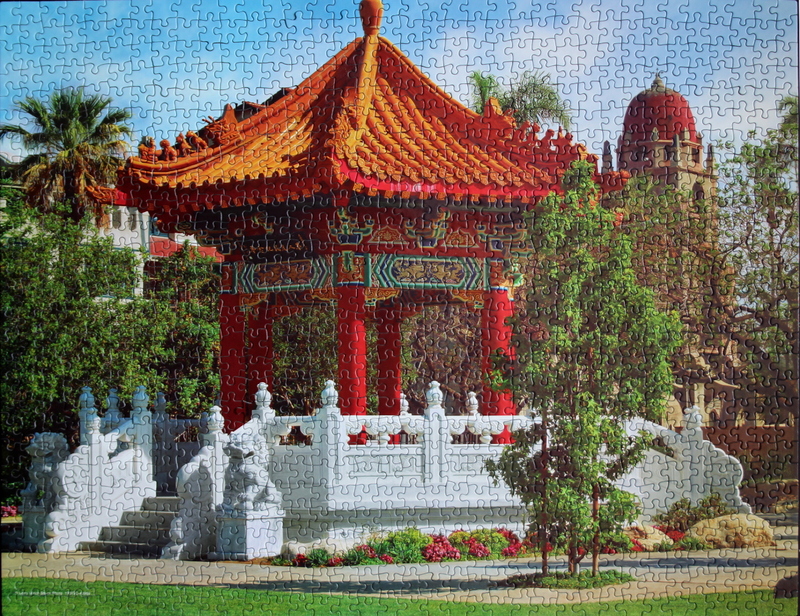 Notes: The imagery for this puzzle does look beautiful, and I had fun assembling all four sides of the lantern, together with my son. 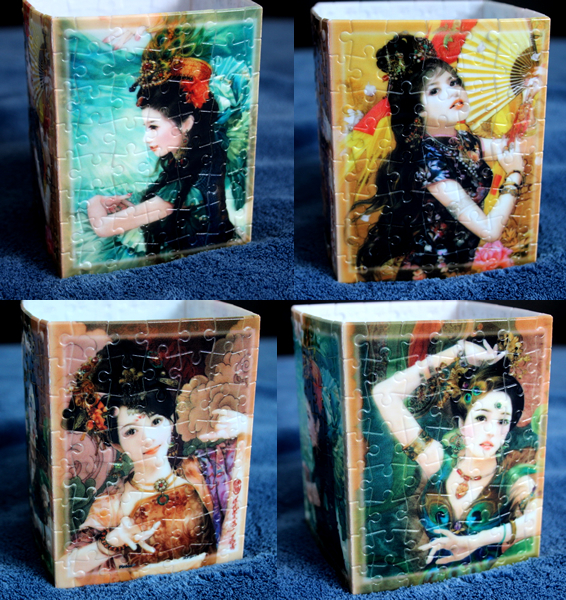 However, putting them together into a 3D shape has proven somewhat awkward. The small plastic pieces easily snap out of place and the completed shape does not have proper right angles. The lantern comes with a square black base and a square black top cover, both having grooves to presumably fit the lantern sides into them. 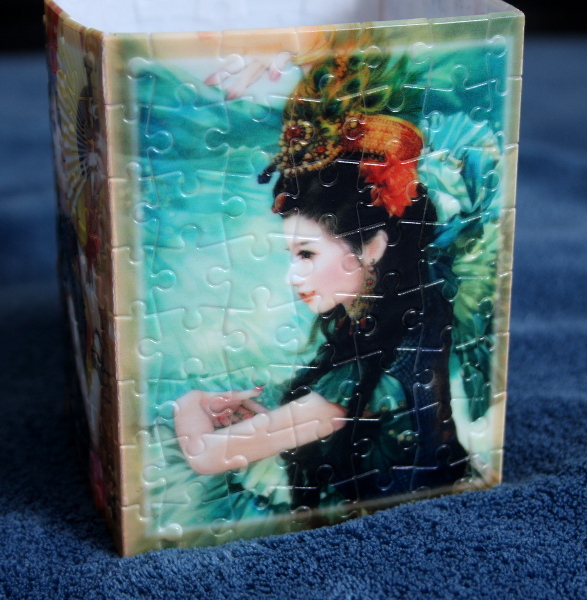 In reality, due to an outward bend of every side, the lantern crumbles into pieces during attempts to fit the base or the cover on. 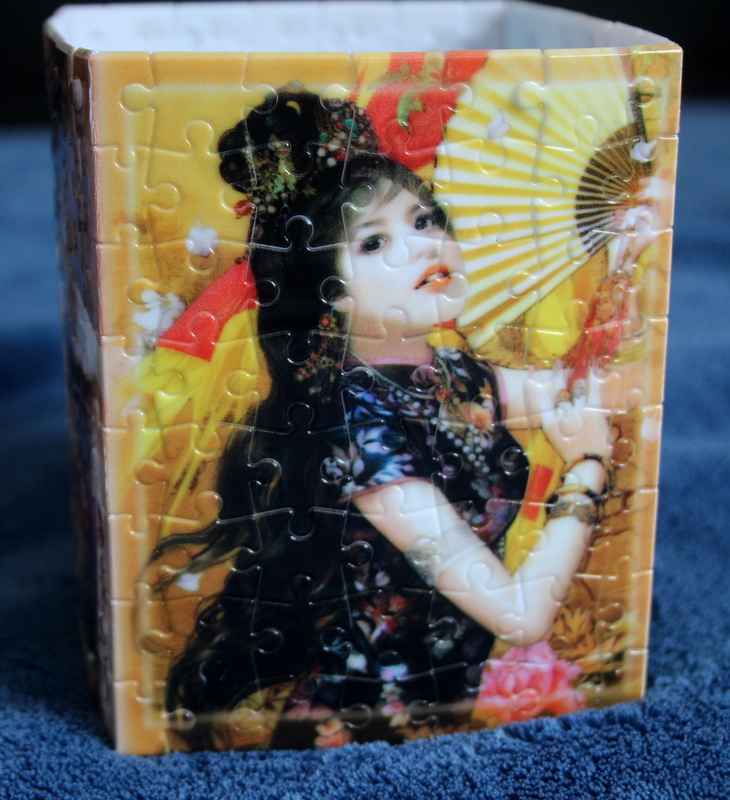 I have been able to fit it into one or the other but not both. 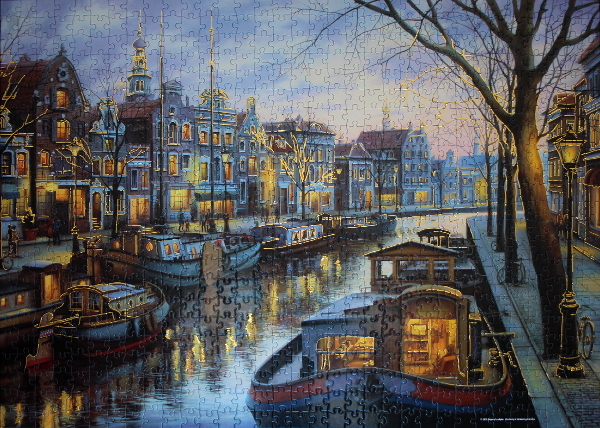 Still, even without the base, the assembled puzzle looks beautiful. 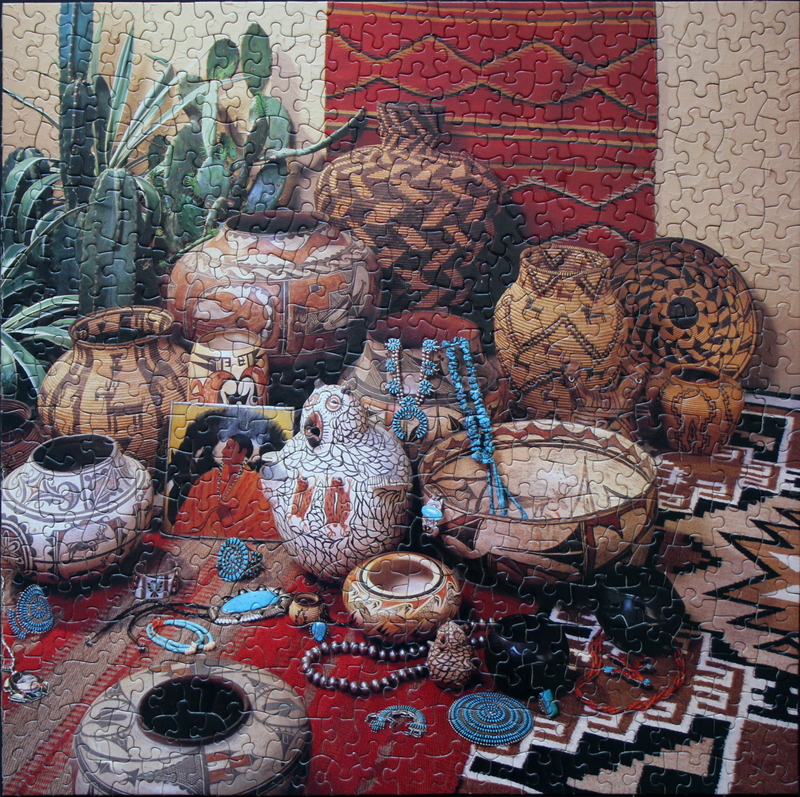 Puzzle: Beautiful, earthy colours showcasing unique artifacts — I loved this puzzle so much, it is now decorating our guest room wall. 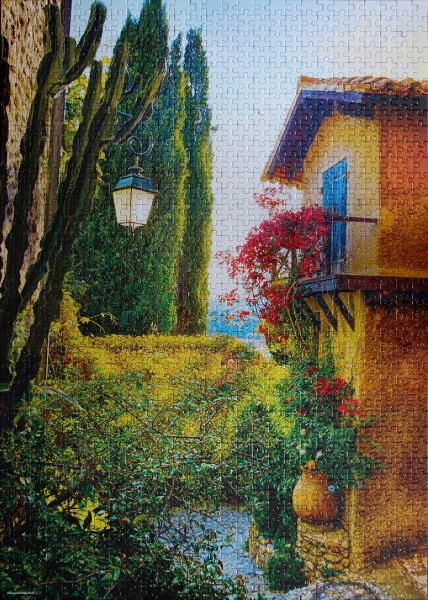 With a variety of textures and colours, it was a pleasure to put together. Since there are so many areas of pattern, good areas to start are the only few solid colour patches of the wall, the green plants, and the red of the carpet. 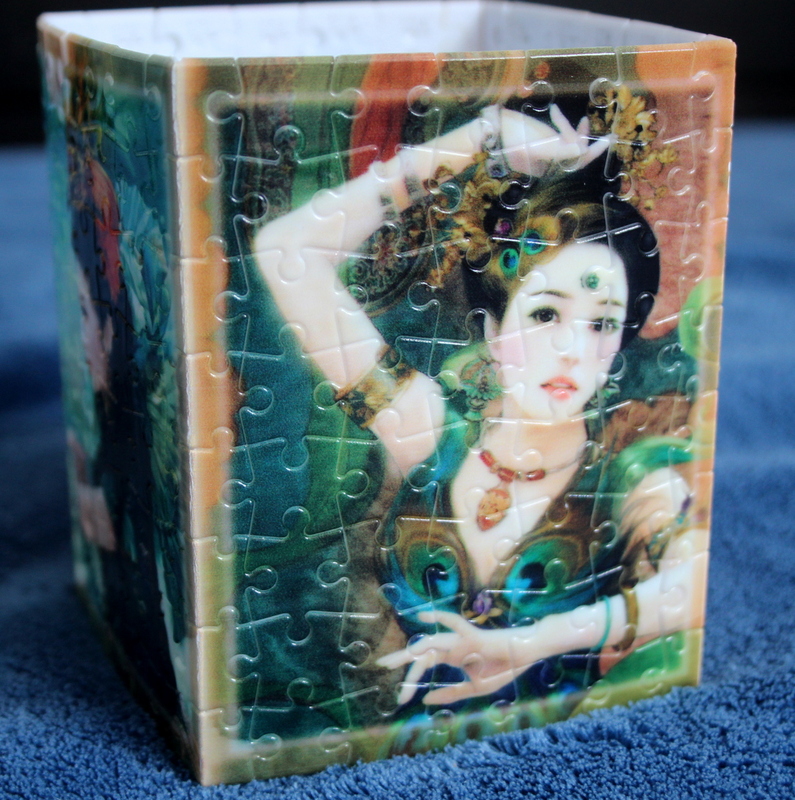 After that, turquoise jewellery pieces, the icon, and different bowls can be assembled separately. It’s fun to bring them together afterwards, and fill in the gaps with the carpet patterns. Puzzle: First puzzle assembled in our new place — after all the moving and organizing, it was nice to get lost in the antique feel of this cozy store. 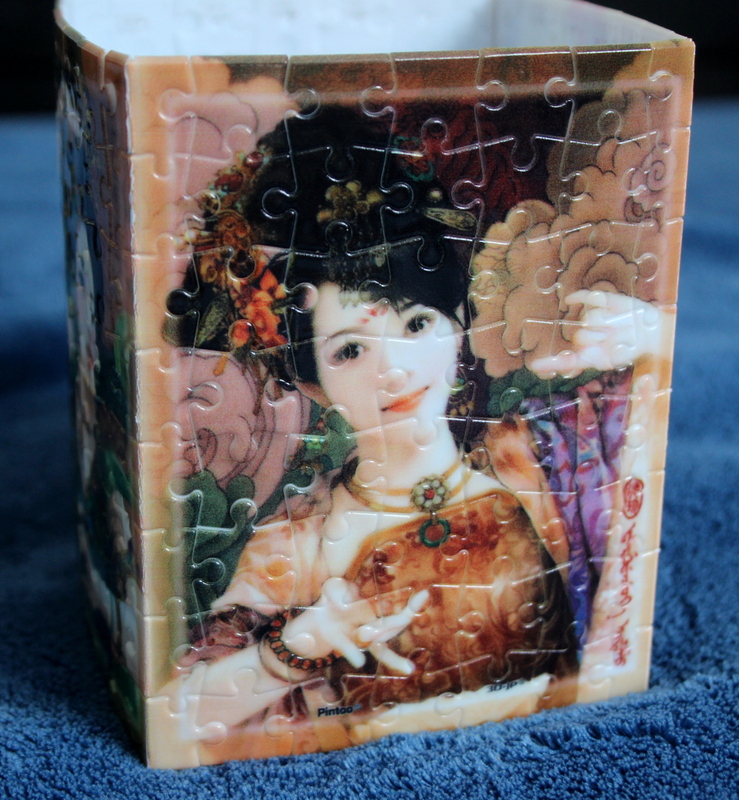 The pieces fit together well, the puzzle is small enough to be simple to do, while a bit of challenge is being added by small repetitive detail of the merchandise shelves. A good place to start is the wheel and the wooden bottom part of the display. 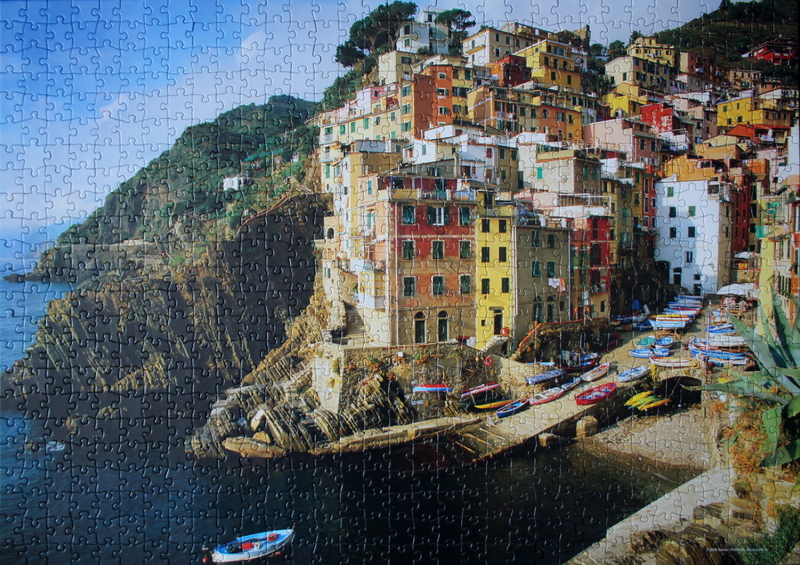 The counter top separates the picture into top and bottom parts and provides a straight line guide around which the puzzle can be build. The colourful dishes with candy, the black boxes under the counter, the bench and the floor are good to tackle next. Then all that remains is to play with the tiny cans on shelves. 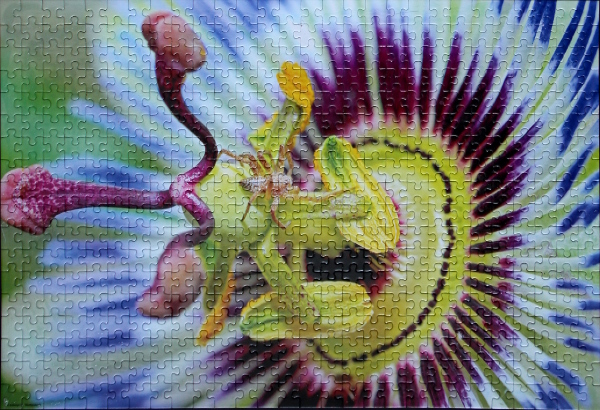 Puzzle: From the same series as the Passion Flower puzzle, this lovely shell was a pleasure to put together. Not completely trivial due to repeating patterns, but with enough colour variation and clear outlines to easily guide the assembly. 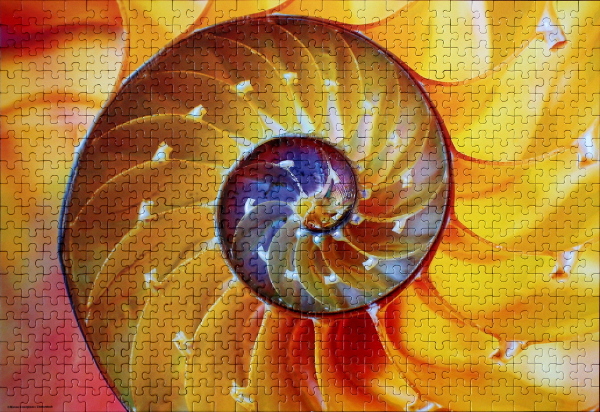 Good places to start are the red, purple and pink regions, dark spiral outline, followed by darker brown, pale blue, and bright yellow areas. The rest falls into place easily. 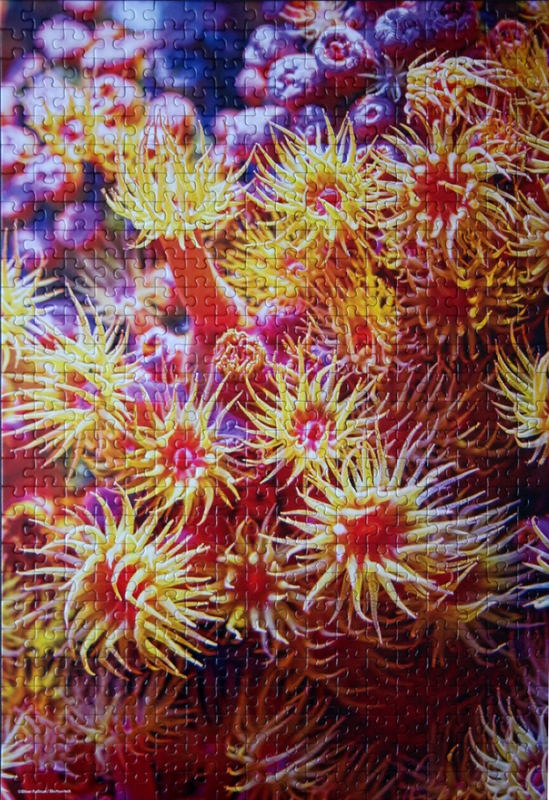 Puzzle: Bright and lovely puzzle, from the same series as Tropical Flowers, this one takes a bit more time to assemble, due to subtle textures and colour transitions. 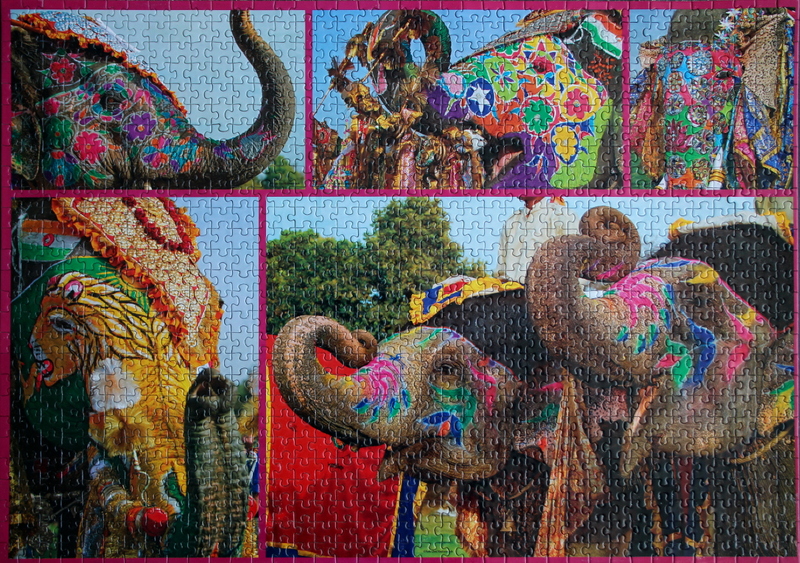 The borders are a logical place to start, followed by the red cloth, the yellow and green elephant head in the lower left, the patches of sky bordering on other objects, and the elephant paint patterns. The trees and grass of the lower right picture are also distinct enough to be easily assembled. 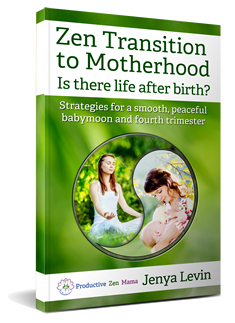 The remaining regions take a little more time and attention. 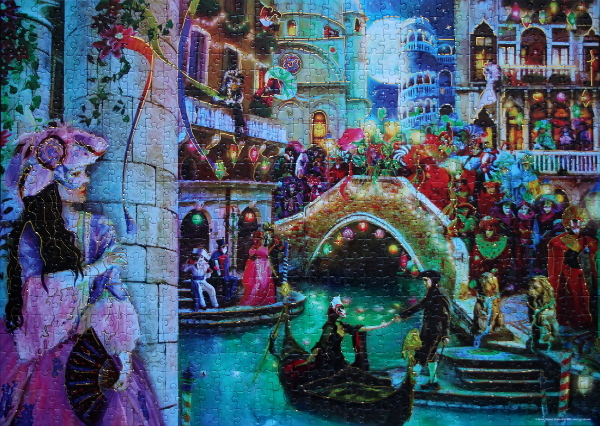 Yet another Josephine Wall puzzle, detailed and intricate as always. Lots of subtle shades and distinct textures. 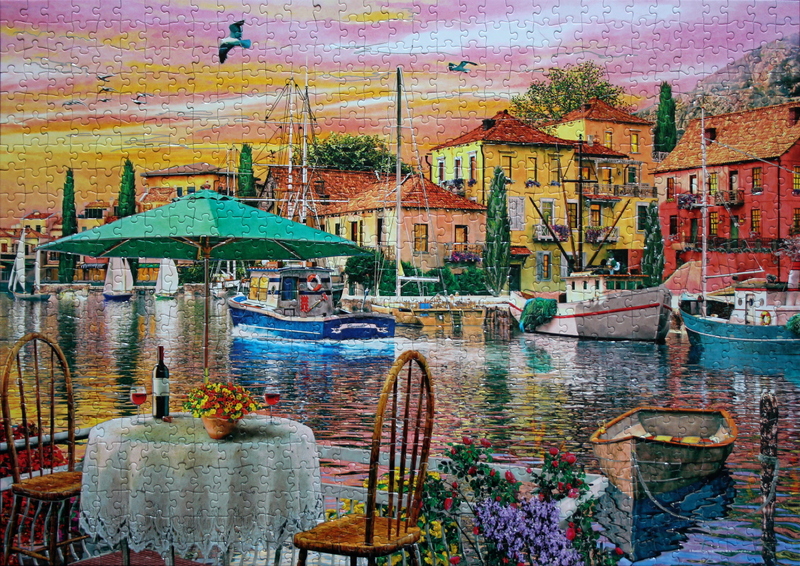 This is a puzzle to do over the course of several evenings, at a leisurely pace. 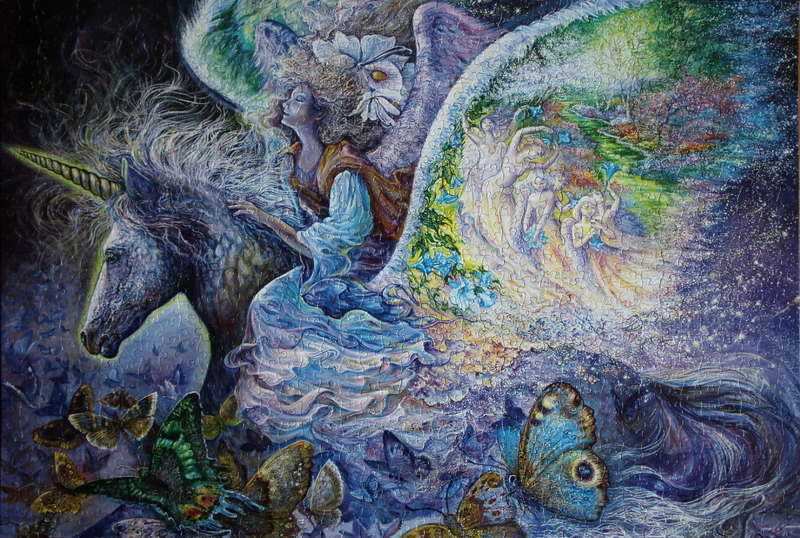 Good places to start are the unicorn’s head outlined against the background, and the top borders of the wings. The bright green and yellow areas, the figures under the wing, the butterflies, the ripples of the dress, and the starry-textured top right corner are distinct as well. 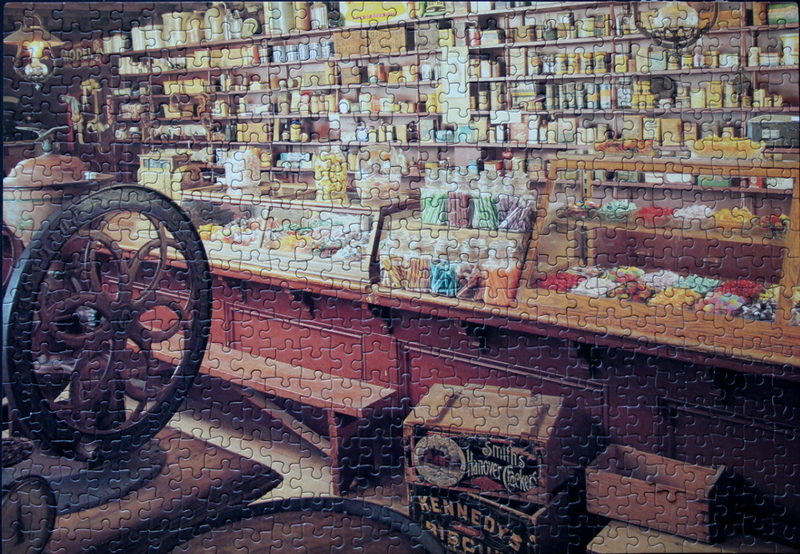 With the Sure-Lox pieces, the puzzle assembles well. 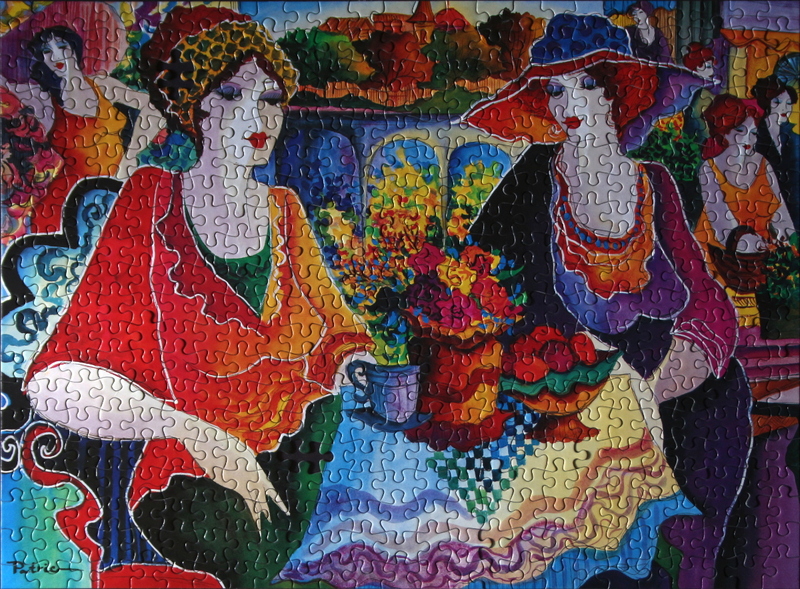 Puzzle: From the same series as Ladies Night and Apple Picking, this vibrant puzzle is a pleasure to do — it only took me a leisurely two hours from start to finish. 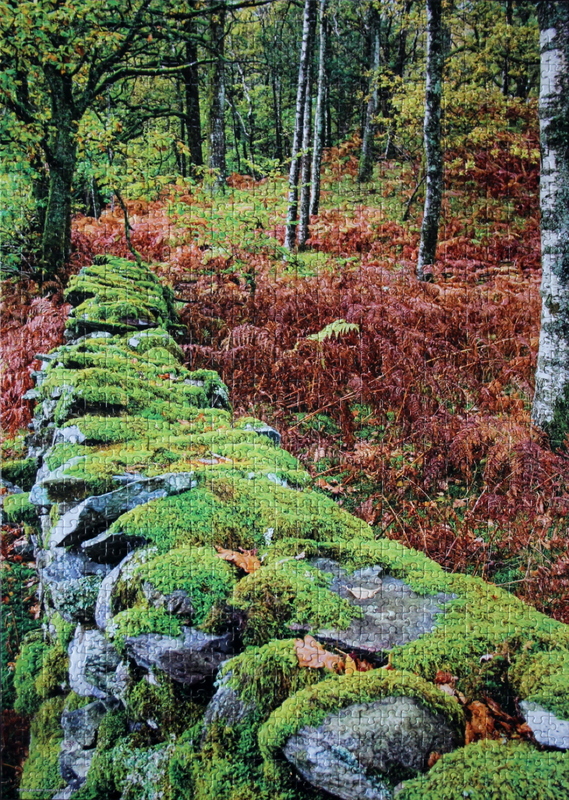 The borders between neighbouring colours are well-defined and the textures are distinct in different parts of the image, so the assembly is a breeze.